There’s an old rule that says when it comes to cheap, good, and fast, you can have two of the three but never all of them at once. 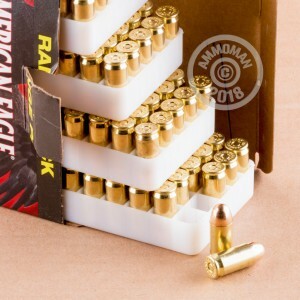 Well, whoever came up with that rule must never have ordered these 45 ACP cartridges from AmmoMan.com! Federal’s American Eagle ammunition is built especially with the discerning high volume shooting enthusiast in mind. The Minnesotan company has invested tremendous effort into streamlining their production process to perfection, so they can crank out ammo in volumes that are priced to sell! 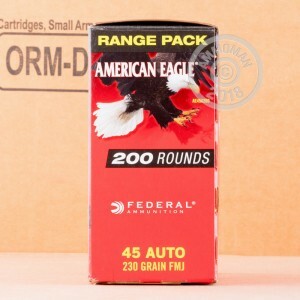 American Eagle ammo is never lackluster, though. This round’s 230 grain projectile, a weight near and dear to any 1911 lover’s heart, is layered in a full metal jacket with uniform wall thickness that promotes straight shooting. Federal made this round’s primer to be super responsive, and that its propellant burns so clean means you’ll spend your time at the range actually shooting instead of fumbling around with a cleaning rod! Each of this bulk pack’s 1,000 rounds sport uniform brass casings as well, so they’ll cycle efficiently and pose great value at the reloading bench after the fact. The fast part is all on us. We’ll get these 50 pounds of rounds right to your door in a heartbeat, and because you’re buying in bulk we’ll do it for free! Never miss a chance to work on your marksmanship -- order today!